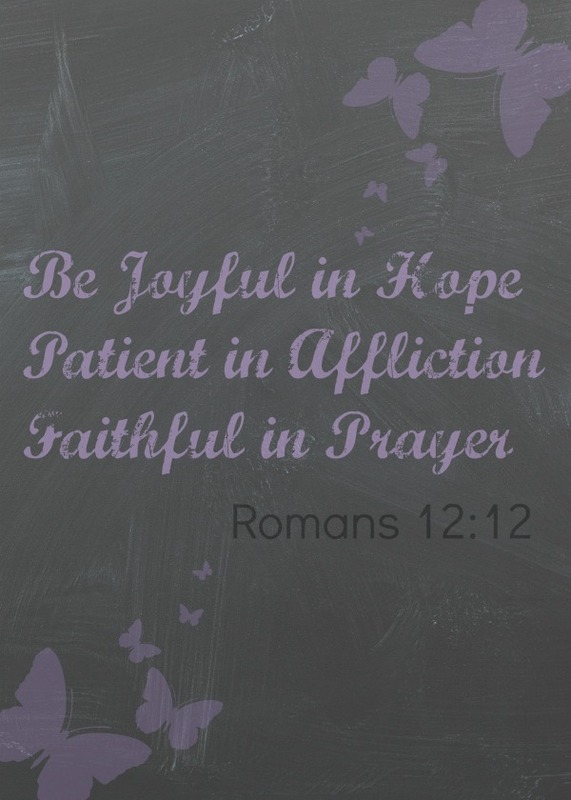 I mentioned in the post, Favorite Verses, that my favorite verse in the Bible is Romans 12:12; and in particular from the NIV translation: Be Joyful in Hope, Patient in Affliction, and Faithful in Prayer. I feel that, in life, this verse has been especially applicable and has gotten me through some very tough times. To me, this verse means celebrating the small things in life, to trust in God, and to never stop speaking to God. I have certainly been guilty of not fully trusting in God and of ceasing speaking to God. But, since the birth of my first child, I’ve learned to appreciate everything in life- no matter how small. I’ve wanted to make it a point to be as transparent as possible with this blog. And by that, I mean not sugar coating anything and staying as true to myself as I possibly can without treading into the world of too much information. As a child, I was fairly outgoing, a social butterfly, and friendly. I also experienced my fair share of bullying though not to any major extent but I was picked on because I was ‘too small’ or ‘too skinny’. Usually, I could let this roll off of my back, because I didn’t care. It wasn’t until I was closer to being a teenager that I started to care about such things- as most teenage girls tend to do. But then, when my son was born, my life changed. As I mentioned in my post, Road to Motherhood, my son was born at 24 weeks gestation when I was a sophomore in high school. He spent nearly four months in the Neonatal Intensive Care Unit before he was able to come home. In the first few weeks following his birth, I had him baptized (just in case) and still have the shell that was used to hold the holy water. During this time, I also met with the hospital chaplain quite frequently. I asked for a Bible and a rosary, because that was what I remembered doing with my grandmother. I prayed the rosary because it was familiar, not because I had that much faith in it. But I did read the Bible, an NIV translation and my first copy. That summer I read the Bible from cover to cover. I had quite a bit of free time, even between spending time volunteering at the hospital and attending summer school to shave some time from my Junior year. Learning how to be a parent, let alone a NICU parent, was not something that I was prepared for at all. Yes, I had books that I bought and we practiced Kangaroo Care a lot, but I don’t think anything can ever prepare you for the ups and the downs of being a NICU parent. Parenting alone is a daunting task for the newly initiated, and here I was- a teenage mom with a micro-preemie. Some days, I look back, and I wonder how I got through that… it’s not something that I would wish on anyone. Being able to see your baby, but not always hold your baby. Or listening to a slew of medical terms, with the majority of them going straight over your head, and hearing alarms going off right and left. Parenting in the NICU was a life-changing experience. It was during this time that my fascination with the Apostle Paul started, and has continued quite strongly ever since. In particular, the Book of Romans though more mostly known for God’s plan of salvation; stood out to me for that one verse: Joyful in Hope, Patient in Affliction, Faithful in Prayer. This verse spoke to me in this time of need. And soon, I abandoned the rosary for daily prayer. I trusted that God would watch over my son and I, that we would make it through all of this okay. I celebrated all of life’s little triumphs instead of magnifying the bad ones. This verse changed me and changed my way of thinking. Even though I wasn’t actively going to church at that time, I was developing my relationship with Jesus. When my daughter was diagnosed with Autism, this verse once again pulled me through and helped me focus. Through every trial and roadblock that I’ve faced, this verse has helped me to put things in perspective. I wish to share this verse as a printable with you, just right click and save as. What about you? Do you have a favorite verse that has gotten you through a particularly rough time? I'm a stay at home mom aspiring to be a work at home mom, and unofficial step mom of two. I enjoy singing with my church choir, spending time with my family, cooking, baking, crafts, and watching Jeopardy. We always need to remember these things. For it is easy to get swayed when trials comes. Good reminder. Yes, absolutely. Sometimes, I think, it’s all too easy to just want to give up. But that’s when we really need to fight. Thank you for sharing your story. God is faithful. Rest in Him. Hi Marie 🙂 Thank you for taking the time to read and comment, that means a lot to me. I will definitely have to add this to my list of verses. I really like the message in that. Thank you for sharing your heart. I love that verse and have so many that have pulled me through various times. Here lately, exodus 14:14 “the Lord will fight for you, you need only to be still,” has been my anthem. Thanks for this beautiful post! Wow. I can’t even imagine. That must have been so tough. That’s a great verse to keep in mind though! Thanks for sharing at Equipping Godly Women Fellowship Fridays! Kori, You have me in tears. Good tears though. My daughter was born at 23 weeks, but did not survive. I miss her terribly, but God has blessed me with two additional wonderful children and I’m enjoying every minute (every frustrating, tiring, sleepless night minute). I think more so than verses, the love of God as demonstrated through his people around me helped. Boy, a little encouragement goes a very long way. Thanks for sharing your wonderful story. Toni, I’m so sorry for the loss of your daughter but that is wonderful to hear that God has blessed you again. And yes, last Sunday, our Pastor reminded us constantly that no matter where we are in life- God’s steadfast love endures forever. What a beautiful story. What a wonderful God! Thanks for joining the Mom 2 Mom Monday Link-Up! Thank you so much, Tauna. And yes, what a wonderful God we serve. I love this verse and the printable! This verse really does cover us through everything! thanks you for sharing it and your heart and encouraging others around you!